If christians wanted to truly change their scriptures they could and would have made far more pronounced and definitive changes. The nonsense apocrypha about jesus that appears in the quran would have been a potent claim to deity – for example jesus breathing life into clay models would have firmly established jesus as a god in the 1st century world. Yet, early christians rejected this nonsense. Furthermore, why not change the scriptures so that the athanasian creed was stated dozens of times throughout the NT? Why not change the NT so that “jesus is God” is stated more directly? It is just such a desperate and ridiculous claim that only the gullible fall for. the textual corruptions are well known to textual critics. Go and get yourself educated dude. Hahaha, Coco’s denial never stops being funny! All people who have not been brainwashed by the Christian cult know that Christians did makes changes to their scriptures. Even the early church fathers knew this. Origen and Dionysius are a couple examples. Joel, you’re just an ignorant guy! The famous christian apologists defending christinaty know this fact, yet they do not give this fact the proper name. It’s called ( corruption). So, why didn’t these “corruptions” go all the way and insert the father, son and holy ghost every few pages or so? It’s an absurd sensationalist claim designed to confuse the gullible. We all know they’ve done that! Do we really need to bring up the end of Mark or the stoning of the adulterous woman or etc etc etc? If there was such profound corruption of scripture, why didn’t the scribes insert the father, son, and HS every other verse or so? Why “corruptions” that are so cryptic? @Joel, the reason why the scribes did not enter the Trintarian perspective of Father, Son, Holy Spirit on every page is because the doctrine in its final form did not exist in the early centuries. But once it was articulated theologians and scribes started manipulating scripture to accommodate it. That doesn’t help you – even if it was true (which is doubtful). Even after the 5th century, there were still few bibles in circulation, the state and church authorities were intertwined, and most of the populace could not read. Any major tampering could have been accomplished quite easily without much questioning from the common man. Islamic authorities destroyed their own primary source materials, there is no reason to believe that christians would not have been able to do so. So my objection still stands. If there was any supposed corruption, why wasn’t it more profound and why didn’t they insert the father, son, and HS every few verses or so? They tried it and got exposed. The trinity was developed over time. So inserting a belief which wasn’t even common in the first few centuries is ridiculous. Your argument is bogus as usual. And I always find this hilarious. Muslim: is the end of mark/ story of ad woman/ john 5:7 corruptions? Muslim: are they found in your comicbook? Muslim: so your comickbook is then corrupt? xtian potato: NO!!!! Sweet jesus Noooo!!! Your book is corrupt. Just get over it already. This is dumb even for you. Trinitarian belief is orthodox and has been orthodox for centuries. I’ll try to explain it as simply as possible. Since most christians believed the trinity, it would and could have been easy to insert the trinitarian formula anywhere into the NT, not just once but dozens of times. It could have been inserted into any of the gospel verses where jesus preaches, it could have been inserted every few verses into the epistles. 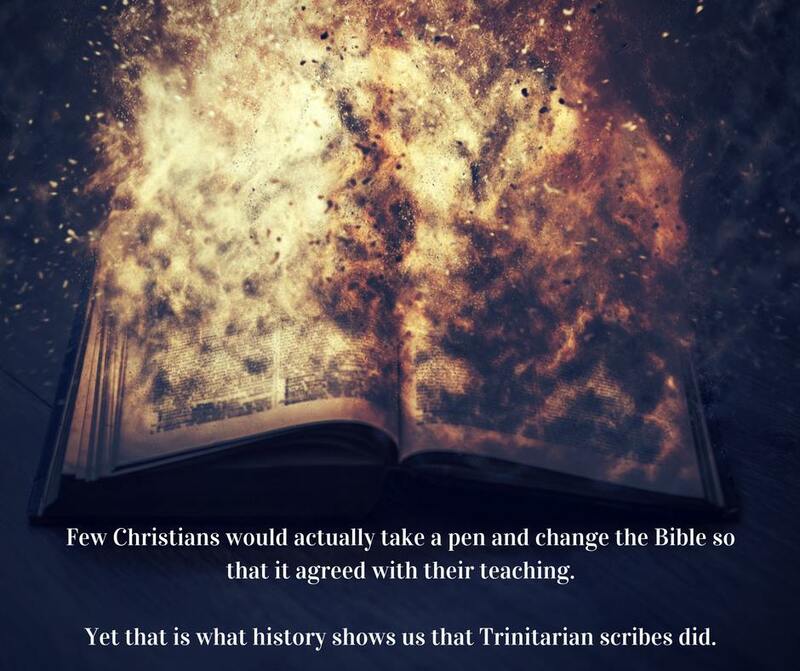 They could even have come up with an entire collection of made up books that they could have said were written by jesus himself, and filled it with trinitarianism. This just didn’t happen. Those who have logical and rational reasoning abilities (not you) should be able to see that since these possibilities were available and no scribe, pope,or church leader, ever took the opportunity to take advantage of them, then any claim of interpolation must be exaggerated. You still can’t answer the question: if the bible had been so liberally changed and corrupted, why didn’t they do a more thorough job of it? Why isn’t the trinitarian formula inserted every few verses? Why weren’t the gospels changed so that it depicted jesus iterating the athanasian creed everywhere he went? You have to think, not blindly follow what your mam tells you to think. Dude I already gave you an example where they tried it and they FAILED. Why is this so hard for you to understand. They FAILED!!! John 5:7 was an attempt. You just try and justify it by saying ‘why didn’t they insert it in EVERY book/page’ thereby giving the impression that having it done (at least) once is not an issue. No it is not. It is orthodox only according to the trinitarians. The first two centuries the trinity was the minority view. There was no trinity is the first century. Even modelism was more common than the trinity at that time. The trinity is a development that took centuries! “Since most christians believed the trinity,” Yes CENTURIES later when the NT books were widespread throughout a large part of the christian world. They have already done it with other people. Since you believe the gospels teach the trinity and since we know these are anonymous works (NOT written by Mark, Matthew, Luke and John). So we have works attributed to people who didn’t write them and have (according to you) the trintarian teaching in them. 2 Peter claims to be written by Peter but it wasn’t written by Peter. And they did with the gospel according to john (john 5:7 and failed!). Now you’re just trolling. You are going against pretty much every Christian scholar on the planet. AGAIN John 5:7 proves you’re just full of bull. Never took the opportunity? Even Jimmy White admits this is the case. Scribes changed the early manuscripts CONSTANTLY! The ending of Mark is a classic example! I have answered it. You just don’t like my answer and deflect from it. The trinitarian view was NOT the majority view in the first centuries. All your scholars agree with this. Trying to insert a view which was nowhere near common is bogus! The trintarian creed only became ‘official’ in the forth century (385). The NT cannon was already known and the books in the NT were already spread throughout the christian world. If you’re going to start inserting passages into them when they are already spread through a huge chunk of the Christian Empire then that would obviously backfire. They tried this centuries later with John 5:7 and look where that got them. ‘IF the bible has been changed and corrupted’? IF? There is no IF here. We already KNOW that it has been corrupted. I gave you the passages. You say ‘a more’ thorough job thereby giving the impression that john 5:7 is indeed a corruption and a deliberate attempt to insert the trinitarian creed into the NT but you try and make it seem as if it is no big deal by saying ‘a more thorough job’. So when you already know they did it (at least) once (just talking about the trinitarian creed) that doesn’t bother you. They have to do it a 1000 times for it to have an effect on you. Why weren’t the gospels changed? They were! Even the authors themselves are guilty of this. Matthew allegedly wrote the gospel of Matthew where he takes the gospel of Mark (an eyewitness allegedly copying from a non-eyewitness) and just changes everything he doesn’t like. Most of Matthew is just a copy of Mark with a Matthian editing. Verse after verse changed to make Jesus seem more like God. With Luke it’s pretty much the same story. Early scribes tried to change the manuscripts MANY times. We know this as well. This is not some wild conspiracy theory. Many didn’t like Jesus having attributes that completely go against divinity. You should take your own advice. Unlike you I do my own research. Lol, somethings never change! CoCo the dancing monkey keeps dancing and keeps getting refuted! Exactly. Normal people would look at this and come to the exact same conclusion: WHAT A MESS! But brainwashed Christians will make excuses for it and still insist that their book has not been corrupted. LOL, see what I mean? Little Coco sees the different canons of his religion and credulously asks “so?” WOW!! So the fact that his Bible has so many versions, and includes “non-canonical” books, somehow is not that important? Who wrote those books? On whose authority? And why didn’t all Christians agree that they are not canonical, and thus NOT scripture? Like I said, normal people would look at this and think “what a mess”, but not the brainwashed Christian zombies. It sounds quite funny (to my ears) that christians still believe that the holy spirit was present to guide the church ‘to all truth’ from the beginning. Often, I reminisce on the many baloney’s of the early church (the battle for today’s canonical books being one of them) and wonder why many brilliant scholars are still trinitarians.